SCVHistory.com LW3051 | Film-Arts | Fireball 500: Publicity Photo 1966. Heartthrobs Frankie Avalon and Fabian fight over ex-Mousketeer Annette Funicello in the 1966 racing feature from American International Pictures, "Fireball 500." Racing scenes were shot at the Saugus Speedway and Ascot Park in Gardena. 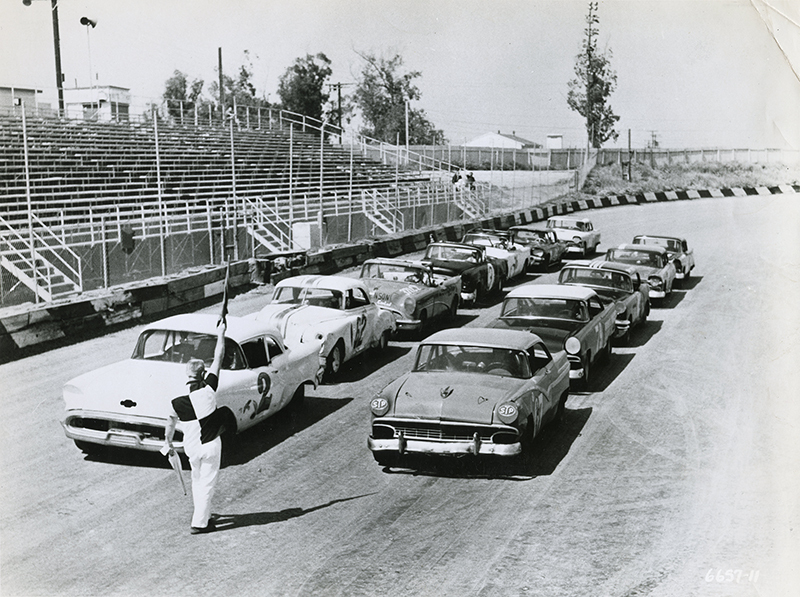 This 8x10 publicity photo probably shows Ascot Park, which was founded in 1957 by J.C. Agajanian as the Los Angeles Speedway. J.C. Aganajian grew up on his father James T. Agajanian's hog farm in the Haskell Canyon section of Saugus. J.C. got out of the hog/trash business at age 18 when he decided he wanted to be a race car driver. While brother Elisha "Aggie" Agajanian took over the family business and became a prominent local citizen, J.C. achieved his own fame and fortune in the racing business as a car owner and big-time SoCal racing promoter. Among his many drivers were Bill Vukovich II, Walt Faulkner, Troy Ruttman and Parnelli Jones. Longtime L.A. Dodgers announcer Vin Scully is the voice (narrator) of "Fireball 500," which also features Chill Wills, Harvey Lembeck, Julie Parrish, Douglas Henderson, Baynes Barron, Sandy Reed, Mary Hughes, Salli Sachse, Patti Chandler, Jo Collins, Karla Conway, Maria McBane, Hedy Scott, Linda Bent, Len Lesser, Luree Holmes, Renie Riano, Sue Hamilton, R.L. Armstrong, Jason Johnson, Paul Napier,	Michael Nader, Billy Beck, Ed Garner, Carol Byron, Bill Putney and Bobby Brack. LW3051: 9600 dpi jpeg from original photograph purchased 2017 by Leon Worden from a photo dealer in The Netherlands.